Trudeau's lawyer Julian Porter sent a letter to Scheer on Mar. 31 pointing to what he called "highly defamatory comments" the Official Opposition leader had made in a public statement two days earlier. Porter took issue with four sections of the statement, calling it "beyond the pale of fair debate" and libellous to Trudeau personally and in his role as prime minister. Speaking about the threatened lawsuit for the first time today, Trudeau said it's important that all politicians be straight with Canadians in how they characterize their actions and beliefs. "I think we are going to have an election in the coming months, and you can't be inventing things," he said on his way into a cabinet meeting on Parliament Hill. "You can't be lying to Canadians, and I think highlighting that there are consequences, short-term and long-term, when politicians choose to twist the truth and distort reality for Canadians, it's not something we're going to put up with." 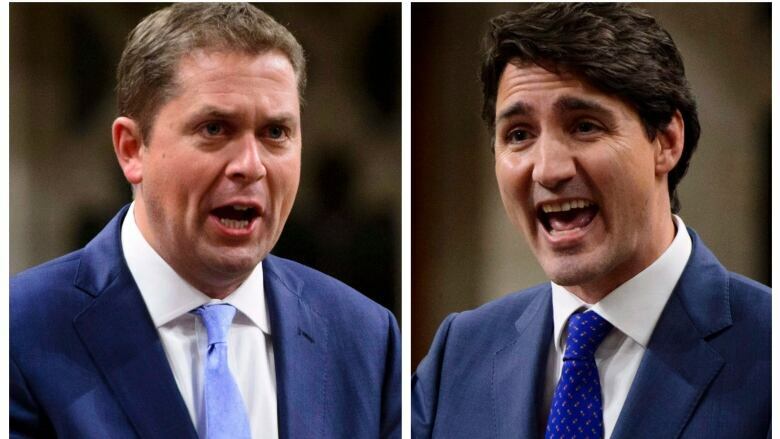 Scheer's March 29 statement, in part, accused the prime minister of political interference, of lying to Canadians and of corrupt conduct in relation to the SNC-Lavalin criminal proceedings. In a letter sent in response to the threat, Scheer's lawyer Peter Downard called the prime minister's complaint "entirely without merit." "It is profoundly disappointing that the prime minister is seeking to silence debate on matters of such great public importance," he wrote. "Mr. Scheer will not be intimidated." "Speaking of distorting reality, does Justin Trudeau still say this story is false? Or that Wilson-Raybould never raised the issue? Looking forward to Trudeau testifying under oath," he wrote on Twitter. One legal expert told CBC Radio's The Current that while Scheer is essentially daring the prime minister to take him to court, it likely won't happen. "If you saw his press conference, you couldn't help but notice that the leader of the Opposition was almost salivating with this prospect, because he wants to see the optics of a whole slew of witnesses and discoveries taking place, and emails, letters ..." Errol Mendes, a professor of constitutional and international law at the University of Ottawa, told host Anna Maria Tremonti. The poor optics of launching such a trial in an election year mean "it's probably never going to happen," he said. Jody Wilson-Raybould and Jane Philpott were expelled from the Liberal caucus last week after they both spoke out about the government's handling of the SNC-Lavalin matter. The Reform Act, a private member's bill that was championed by Conservative MP Michael Chong and passed before the 2015 federal election, was designed to give MPs more control over their leader, the power to expel and reinstate caucus colleagues and the ability to choose their own caucus chairs. "Members of Parliament are not accountable to the leader. The leader is accountable to members of Parliament," Philpott said. "This is a constitutional convention." "The will of caucus was very, very clear, that they wanted the two individuals removed from caucus," he said. "It was my decision to make, but the fact that the caucus was clear and united made my decision easier." "As is well known, caucus meetings are confidential. But as it pertains to the question of the Reform Act, we fulfilled the requirements of the act," NDP MP Brian Masse said in a statement. "Recorded votes were conducted rejecting all elements and the results were transmitted to the Speaker, as required." Today, Liberals on the Commons ethics committee blocked two more motions from the Conservatives and the NDP to study the SNC-Lavalin affair. Liberal MPs on the committee already have used their majority to defeat a Conservative motion to launch an inquiry, arguing that the justice committee's work was ongoing and Wilson-Raybould was expected, at that time, to present a written submission. "For us to then undertake and renew this process all over again doesn't strike me as an effective use of our time," he said. Conservative MP Peter Kent said "huge questions" remain that the prime minister and some of his top aides should answer. "This is a political crisis that is unprecedented," he said.